Hillside setting with fabulous coastal views, private pools and gardens a family friendly property. Located on the East Coast of Zakynthos - an Island at the Ionian Sea, the spellbinding Emerald Deluxe Villa promotes the traditional architectural in the most luxurious way. Throning from a peak of a private hill in the area of Askos, this exquisite stone villa has the magical power to stun with the magnificent views and its lavish amenities. The has 4 bedrooms and 4 bathrooms, (comfortable for up to 8 people) fully equipped kitchen, dining area, living area, infinity pool with hydro massage, children’s pool, private playground, private parking area, outdoor dining-living area, outdoor shower, bbq, satellite TV, Wi-Fi. The villa is fully furnished with taste, style and quality furnishings. The villa accommodates up to 8 people. Ground floor: Fully equipped kitchen with dishwasher, electric cooker-oven, microwave, refrigerator, kettle, toaster, toastie maker, coffee machine and a full range of cooking equipment and utensils. Dining area and living area with fireplace, and large sofa comfortable for up to 8 person. One master bedroom with a double bed and en suite bathroom and one twin bedroom with a w-c/shower room next to it. Utility room: Washing machine, iron and ironing board. First floor: One master bedroom (one double bed) with en suite bathroom and one twin bedroom (two single beds) with en suite shower room. Outside area: Private pool with hydro massage for up to four people, children’s pool, playground, lounge area, dining area, built bbq, shower with cold/hot water , private parking area detached to the villa and panoramic sea views. En-suite bathroom to bedroom 1: bath with Jacuzzi, basin, wc and telephone. En-suite bathroom to bedroom 2 with bath, Jacuzzi, basin, wc and telephone. En-suite shower to bedroom 3 with shower, separate wc, basin and telephone. Separate shower/wc room. Notes on accommodation: All the properties are fully air conditioned. Highchair/baby cot on request. Wireless Internet access. Telephone/fax service. First aid kit available in the villas. Outside: Emerald Deluxe villas are 440 sq.m. each (180 sq.m. internal space and 260 exterior fenced space). They all have their private fenced land, private shaded parking area, private full tiled pool (40 sq.m.) with hydro-massage, children's pool, playground, sun loungers and umbrellas, covered terrace with table and chairs for 8 people, extra seating area, outdoor shower with cold and hot water, barbecue area. 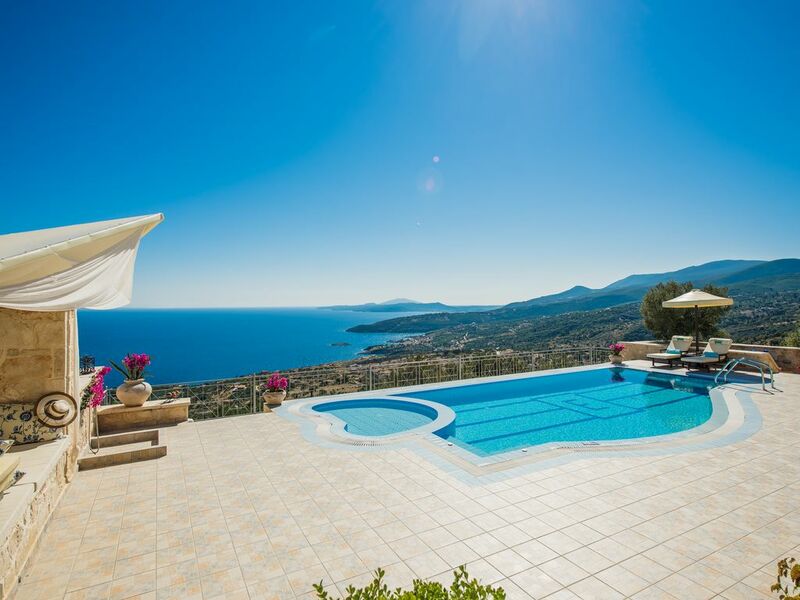 The magnificent views from the villas extend out over the Ionian Sea to Kefalonia and across the whole of the East Coast of Zakynthos from the Port of Agios Nikolas in Volimes to the bay of Laganas. Utility Room: Washing machine, iron/ironing board. Cleaning / Towels / Linen / Maid service: There is daily maid service and pool care. Towels and bed linen changed every 2 days. Bed slippers and bathrobes provided. Pool towels provided and changed every 2 days. Our house were wonderful and very helpful. Our villa was 5 star deluxe. The staff was wonderful and even scheduled massages for us at our villa. You can have dinner delivered. I can't think of one thing that was amiss as we all enjoyed every second. We can't wait to return to Zakynthos Greece. Agios Nikolaos port has its own small beach which is only a short walk of 10 minutes away. Makris Gialos, another famous beach, is 15 minutes driving away. Sandy beaches you can also find in Alykes, 20 minutes drive away from Emerald Deluxe Villas. 2.5km from boat marina (to moor your boat). 2.5 from ferry to/from Kefalonia. 30km from Zakynthos Town. 2.5km to the beach. 2.5km nearest amenities. 2 km from Makrys Gialos Beach. 3 km from Xigia springs. 2 miles from blue caves. 5 miles from Shipwreck. Peligoni Club for water sports and sailing is also a short walk from the villas. Askos Stone Park is also close to the villas for exploring the natural life of the island. Booking Notes: You may cancel your booking and get refunded if it is at least 1 month before your arrival, if it is after that period of time then you loose your deposit. If you have arrived at your villa and wish to cancel the rest of your stay then you pay for the nights you have been accommodated and 50% of the rest of the period that you have booked. Changeover Day: Changeover day: Flexible Check In: 14:00 Check Out: 10:00 Notes on prices: Prices are per villa per night in euros and not per person. 30% deposit is required to confirm the reservation. Rental includes a basic welcome pack and maid service. The property is available for long winter lets.